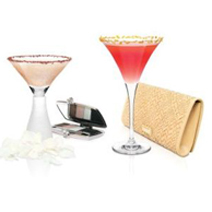 Feel a little extra chic with these classy new drinks by SKYY Vodka. Mercedes-Benz Fashion Week in New York kicked off Sept. 6, and even if you’re not at the runway shows for the spring 2013 collections, you can strike your best pose and sip on the same cocktails as fashion insiders. SKYY Vodka has whipped up four signature cocktails for official receptions and VIP lounges. The drinks are inspired by next spring’s trends — classic, romantic, glam and progressive. Bohemian Classic is a lighthearted twist on the daiquiri. Enchanted Kiss blends vodka, creme de cacao white simple syrup, cream and ground cinnamon. Catwalk Queen is an evolved white cosmopolitan. Futuristic Fashionista is made with muddled red grapes, vodka and lemon juice and topped with red raspberry vinegar. Give one or all of them a try, but you might want to stay off the runway. Even the most experienced models have been known to take a tumble, and all they had to drink was bottled water. Join the Ion Style team and let’s toast the start of another Fashion Week. 2 oz. SKYY vodka/2 oz. apple juice/0.5 oz. lemon juice/ 0.5 oz. simple syrup/6 raspberries. Muddle all ingredients. Shake and strain into a martini glass. Garnish rim with honey sugar and little pieces of orange peel. 2 oz. SKYY vodka/1 oz. lemon juice/0.25 oz. red raspberry vinegar/5 red grapes/gold sugar. Muddle all ingredients except the vinegar. Shake and strain into gold sugar-rimmed martini glass. Add vinegar. 1.5 oz. SKYY vodka/0.5 oz. creme de cacao white/0.25 oz. simple syrup/0.5 oz. whole cream/0.25 tsp. ground cinnamon/sprinkle of chocolate flakes. Shake all ingredients except the chocolate flakes. Strain into a martini glass. Finish with the chocolate flakes. 2 oz, SKYY vodka/1 oz. lemon juice/1.5 oz. white cranberry juice/0.5 oz. honey solution (equal parts honey and water)/0.5 oz. triple sec. Shake all ingredients. Strain into to a martini glass.